Frameline’s San Francisco International LGBTQ Film Festival is about more than just its films. 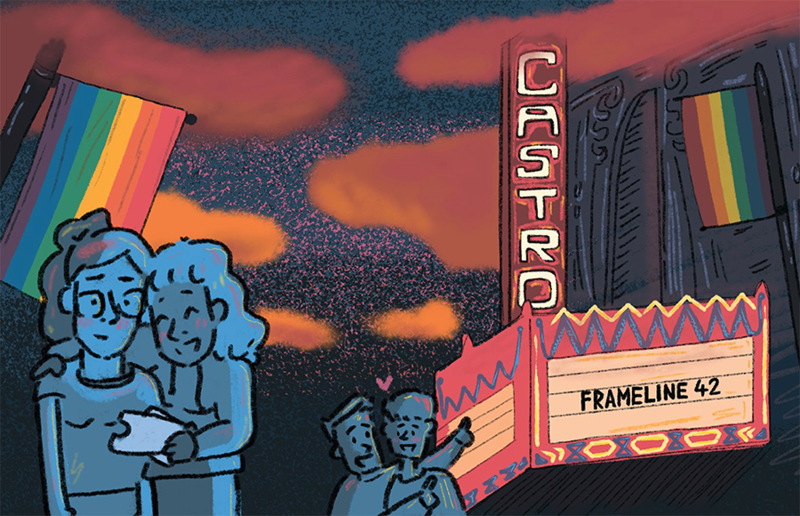 The crux of Frameline is a head nod from a rainbow-clad screening volunteer, a reference only your queer friends know whispered as the lights dim, a scream during a silent moment of subtlety onscreen. Here, a community that so often finds its representation in the margins, in the subtextual and inexplicit, receives not just one film but an entire festival. There’s an incomparable sense of pride in the air at each screening — these are films that are often made by LGBTQ+ folks, screened primarily for LGBTQ+ folks, and always about LGBTQ+ folks. The films may be laugh-out-loud funny, whether filled with queer in-jokes or jokes your straight or cisgender friends or parents may enjoy. Some may be calls to arms — after all, Frameline42’s tagline is “Lights. Camera. Take Action.” While there’s still a long way to go for LGBTQ+ cinematic representation — having yet to move away from the upper-middle-class, white, cisgender stories it so often prioritizes — Frameline will be there, supporting LGBTQ+ films as they develop and progress, as they mirror our world and reflect what it could be. Caroline Smith is the arts & entertainment editor. Contact her at [email protected].